Kuching is the state capital of Sarawak and is the largest city on the island of Borneo. The name of this city was given by Charles Brooke, the second Rajah of Sarawak in 1872. 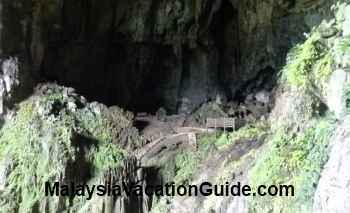 It is located at the bank of Sarawak River or Sungai Sarawak. 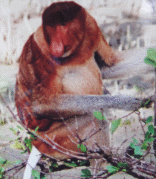 Although the name means cat in the Malay language, the origin of the name was not clear. However, in the effort to boost the tourism of the city, many statue of cats have been erected to promote the city. 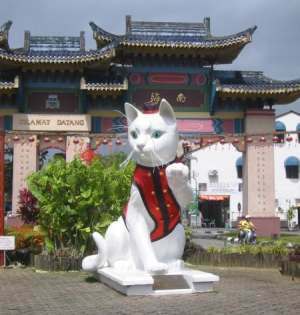 A large statue of a pussycat with blue eyes known as Great Cat of Kuching is located at Jalan Padungan. 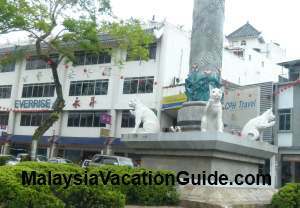 You will also find cat statues near Holiday Inn Hotel. This historical city has many attractions that you can see and do while you are here. The Great Cat with bow tie. Take a walk around the Waterfront and see the historical buildings, many of which are still in good condition today. The Square Tower which is located at the Waterfront was built in 1879 and used to be a jail for the city. It's architecture is similar to an English castle. Look out also for Chinese History Museum which was originally a Chinese courthouse built in 1912. Go in and take a look at the history of the Chinese in Sarawak. Admission to this museum is free. Across Sungai Sarawak from the Waterfont is the Astana which stands for palace in the Malay language. This palace was built by Charles Brooke in 1870 as a gift to Margaret Alice, his wife. This building had undergone extensive renovation and is currently the official residence of the Governor of Sarawak. Take a boat ride from the jetty and see Fort Margherita, built in 1879 by Charles Brooke to guard the city against the pirates. This fort was named after Ranee Margherita, the consort of Rajah Charles Brooke. Today, this fort houses the Police Museum which exhibits the history of the police in this state. There are boats or sampan that take passengers to and fro the river all day until late at night. The river crossing during the day costs less than RM 1 per person. You can also hire the boat for a cruise that will cost about RM 30 per hour. Negotiate the fare before you hire the boat. Look out for The Courthouse just in front of the Square Tower. This structure was built in 1874 and is the Tourist Information Centre of Sarawak Tourism Board. A 6 m granite obelisk was erected in 1924 at the compound of this building as a memorial to Rajah Charles Brooke. The Pavilion, a 3 storey building colonial style building was built in 1907. It is located in front of the General Post Office. This building houses theTextile Museum today. Go in and take a look at the many exhibits relating to the textile history of Sarawak. See also the Kuching Mosque which was built in 1968. Learn more about the history of Sarawak by visiting the many museums in the city. Admission to all the museums are free of charge. Sarawak Museum is a must. Other museums that you may want to visit are the Chinese History Museum, Textile Museum, Islamic Museum, Cat Museum, Timber Museum and Pua Kumbu Museum. Take note that most museums open from 9 am to 4:30 pm. 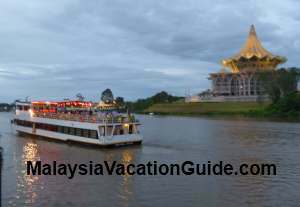 Go for a sunset cruise on Sarawak River and see the city of Kuching as well as some of the fascinating landmarks. Hire a boat to cross the river or for a cruise along Sungai Sarawak. You will enjoy it. Go for a sunset cruise and enjoy the scene of this vibrant city from Sarawak River. This cruise departs from the Waterfront Jetty at 5:30pm and ends at 7:00pm. The price is about RM60/adult and RM30/child(4-12 years old). Notice the following buildings and landscapes as you cruise along this river. Shop for souvenir at the Main Bazaar among the single storey shop houses opposite the Waterfront. Most of the shops are over a century old and you will be able to buy souvenirs, blow-pipes, swords, baskets, mats, rugs, bamboo and other local produce. Look out for souvenirs that are unique among the various ethnic groups of Sarawak. The Iban with their Pua Kumbu or hand woven rugs, the Orang Ulu are skilled in woodcarving and beadwork, the Bidayuh are renowned for their basket weaving and the Penans for their blowpipes. The Wet Market is located at Jalan Gambier and operates from morning until dusk. You can buy local fresh fruits, vegetables, fish, meat and poultry amongst others. Spices such as cinnamon and pepper can be purchased here as well. There are also shops that sell produce imported from India near the India Street. You can find onions, garlic, shallots, nuts, beans, curry powder and other spices here. Jalan Satok is the place where you will find the Weekend Market on Saturday and Sunday. The market opens from 1 pm to 10 pm on Saturday and 6 am to 12 noon on Sunday. This market is where most villagers from outside of the city bring their produce here to sell. Fresh jungle produce, herbs, fruits such as "dabai", bananas, mangoes and "belimbing", "midin", "paku uban", plants, animals and mulong worm from sago tree are sold here. Other produce you can buy here are fish, poultry, wild boars, mutton and other seafood. 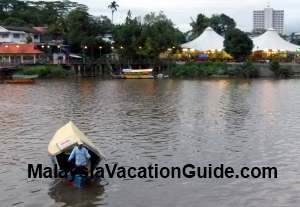 There are many hotels in Kuching for accommodation. High end hotels include Hilton Hotel, Riverside Majestic Hotel, Merdeka Palace Hotel and Pullman Kuching. 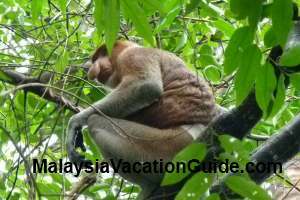 Budget hotel include Borneo B&B, Singgahsana Lodge and Kapit Hotel. Make this capital city as your base as you explore the nearby attractions. 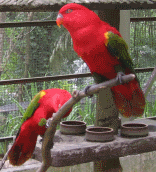 Do a half or full day tour from the city to Bako National Park, Bau Wind Cave and Fairy Cave, Semenggoh Wildlife Rehabilitation Centre and Sarawak Cultural Village. 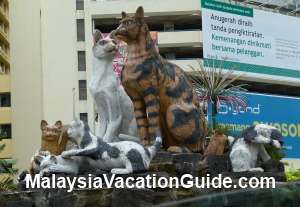 Yet another statues of cats that you will not miss as you explore the city. The capital city has an international airport that connects to Kuala Lumpur, Johor Bahru, Jakarta, Hong Kong and Singapore. Low cost carrier airline AirAsia has regular promotional tickets to and from this city. The domestic flights to other cities of Sabah and Sarawak such as Miri, Sibu and Kota Kinabalu are also serviced here. The Visitors Information Centre is a must if you are planning to get more information and brochures of the places of interest in Sarawak. It is located opposite the Waterfront. You can also collect your brochures from Tourism Malaysia once you arrived at the airport. 8am to 5pm from Monday-Friday.